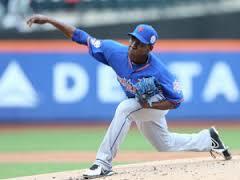 Rafael Montero broke out in the minor leagues in 2012 and 2013 with impressive seasons. He was considered to be one of the strong starters the Mets had in their back pocket, as the organization had many prospects working their way to the major leagues. Since the Mets have called up those prospects, Montero has struggled to find a role with in the big league ball club. With Bartolo Colon returning, and the starting rotation set, what should the Mets do with Montero in 2015? The offseason seems to be complete for the Mets, although many people think the team should add another reliever to the bullpen. This is where Montero could increase is value throughout the season. The past three closers for the Mets have been Bobby Parnell, Jennry Mejia, and Jeurys Familia. All three were starts turned relievers, and all experienced success. Just because these three pitchers panned out in the bullpen does not guarantee Montero success when he joins the bullpen. His fastball tops out around 94 MPH, but his location could provide him with an advantage over other relievers the Mets currently have. The Mets seem to be planning for Montero to come out of the bullpen, as he pitched in relief during the Winter League this season. He pitched one inning, allowed one homerun and struck out two. Last season, Montero only pitched in five games for the Mets, and started in one. In the single game he started, he pitched 5.2 innings, struck out six and allowed three runs. If Montero were to start, he would be towards the backend of the rotation, and he could provide quality starts. Montero could also go back to Triple-A Las Vegas and start in games. If an injury were to occur, the Mets would not have to remove Sean Gilmartin or Logan Verrett from the bullpen, and could just call up Montero to pick up spot starts. By choosing to start him in the minors, he could also become more marketable if he has success in Triple-A. Relievers have been gaining more value, as we saw Aroldis Chapman and Craig Kimbrel get traded for decent returns. However, teams are searching for young, controllable arms, and Montero could be attractive to teams searching for these types of pitchers. 2016 will be an interesting year for Montero going forward. He was considered to be a piece to the rotation, and last season was spent going before the disabled list and rehab assignments. He was placed on the disabled list April 30th, and did not make it back the major leagues. Sandy Alderson said that Montero would not be helping the team in 2015, as his setback in August marked the end of his campaign. As of now, the Mets seem to want Montero to start in the big league bullpen, and he will probably make spot starts throughout the year to give the starters a rest. Plus, we know that Zack Wheeler is coming back, and will be eased back into starting games, so it will be nice to have some length available in the bullpen. Hopefully Montero can stay healthy throughout the year, and will contribute at a high level. Lets face it, we have absolutely nothing more than speculation about Montero at this point. We have no clue about his injury, its progress, or its prognosis. The winter league data says nothing. So, whereas it may be easy to begin to pencil in Montero for major league action based on long ago results, before he sees any major league action, I have him at big league camp, then begin his ascent to the Show from St Lucie, to Bingo, to LV. He should excel at every phase before Id cal him to Queens. Montero should only pitch in relief if he has an outstanding spring training and wins the 7th inning set up spot. The Mets are much thinner at starting pitching in 2016 and will need some stretched out AAA pitchers to fill in on the major league in case of an injury. Montero and Verrett are the likely candidates. Montero has to stay ahead of Verrett on the depth charts in order to get this opportunity and he must seize it when it comes. Montero making the team as a second tier reliever would only reduce his value. He has the pedigree to be a major league starting pitcher and may be a less expensive option as a future replacement for one of the fab five. I agree with Chris in that we have no idea what to expect from Montero until he shows up healthy to camp. The one thing I want the Mets to do with him is pick one role for him and stay with it. At this point, I’d rather that they put him in the sub-optimum role of reliever for 2016 than jerk him around moving back and forth in his role. While there’s no proof that moving around caused his injury last year, it’s not unreasonable to think it was a contributing factor. 2015 was a lost season for Montero. Shame. I’ve been really high on this kid since seeing him up close in spring training a few years ago. Reminds me a lot of Ramon Martinez. Has a nice whip to his arm that generates natural movement and keeps the ball low in the zone. Hope he can get back on track. If Montero comes through and contributes meaningful innings to the Mets this year, it’s a big win for the club. If he disappears into the void, it’s an unexplained loss. It’s the same scenario as the defensive output from Lagaras. If he contributes with crazy UZR and OF highlights, it’s a huge win but if he disappears, it’s another unexplainable mystery. Last season, I believed, and hoped, that Montero could play a key role in the bullpen as a late-inning reliever. Clearly, the Mets desperately needed more help in that area. This season, the Mets (so far) have that same glaring need. A crappy pen. The combination of the Mets starting pitchers, poor defense, and mediocre offense suggest that there will be many, many games decided in the 7th, 8th innings. A bad bullpen can undermine this terrific starting rotation. I’d love to see Montero become a part of that solution. However, to date, he’s never pitched particularly well in the pros and now has this lingering, mysterious injury. I have zero expectations and slim hopes. The team need is in the bullpen; that’s where he must go. Pitching and Pitcher Health is so fickle… Wheeler is Post Surgical. Montero is Post Injury. I believe that explains the Bartolo re-sign. “Depth” and “flexibility” have become the new buzzwords for the Mets this offseason. I am not looking for an assortment of okay guys who can maybe pitch the 8th inning. I want 1-2 guys who know how to shut the door. To me, to win a WS in the modern era almost demands a first-rate bullpen. I thought that was an easy takeaway after 2015, at least. I am still hoping that the Mets will do something significant to address this serious need, which I would have placed at a higher priority than a marginal upgrade at SS for $9 million, or even a #5 starter for $7.25 million. Of course, in isolation there’s nothing wrong with those moves. I just hope they didn’t prevent the club from upgrading the pen, which desperately needs it. James, I completely agree with the notion of how important a bullpen is tonanteam’s success and was also hoping for a bigger signing. However, as a former closer, Addison Reed should be a solid 8th inning guy and now that the innings limits are off, hopefully the 7th inning will be a little less pivotal. If Robles or one of the other guys cant step up, Big Bart can or else we’ll make a July trade. Not having a big bat in the lineup concerns me a lot more. Most teams are not complete or “completed” for the start of the season. Only the Cespee opportunity would seem to provide a Major solution to so many of this team’s needs. The Facts of so much under control, high quality pitching and the reality of higher revenues has me truly disappointed that they seem far away from signing him. It may be an overpay, but it so greatly fits the situation. Otherwise, they are pursuing a really sensible baseball and financial approach—building out a quality MLB roster with “dry powder” for in-season completion. I agree with the comments above. This Met hot stove season will be determined a success or a failure (to me) based upon how they fill the 8th inning spot. So far, they haven’t, and there are less quality options on the market. Be it by trade or signing, I will not be happy unless the acquire an arm that can also competently handle the closing duties should something happen to Familia.